Dark Sable male, big head, lots of drives. Sound dog in family but yet very capable of determining friend from enemy. He is great with kids, cats, live stock etc. 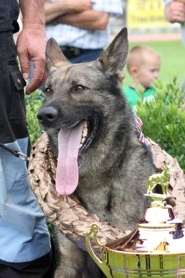 A strong male, not necessarily for first time handlers, but the best family protector imaginable. Brings strong prey drives and food Drive. Sound Character and great type. He produces Dark Sable in Color. He throws his type. Goofy, fun boy to be around. Amazing swimmer! Easy breeder! 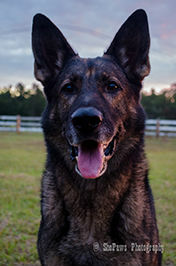 Brongo is retired from competition and was known for his amazing work in obedience and protection. He although a large male and heavy bone is with amazing speed, and carries a full, calm, and crushing grip. The best about him is immediately after bite work you can romp with him in a park and let him be loved on by kids. He, like all our studs is the all around dog. He is a bit stronger in dominance vs. Farin but only when he feels he needs to take control of the situation. His pups are demanded. He is bred very limitedly.